Slippers or house shoes are another sweet and fast gift to make for any number of people in your life. They are easy to sew assembly line style as well, if'n you want to check multiple people off your list. We are largely shoe-free in the house (especially in the wet months) and this year I've resolved to keep a basket of slippers next to the door to keep everyone's toes toasty. I used Amy Karol's pdf pattern (it's a part of her popular Mailorder series and comes with a bunch of extras) and some of the new Innocent Crush Velveteen. The velveteen is freaky soft and was so easy to handle in the machine. You'll also need a little FOE/Fold Over Elastic if you choose this pattern, and we have several plain and velvet (!) options available by the yard. 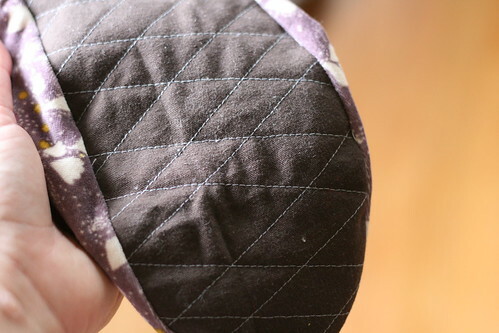 I used some dark grey/purple velvet, which ended up being a little sturdier and easier to sew than the regular kind. The only modification I made was to add some cotton batting as an interlining on the sole. I quilted the batting to the cotton canvas outer sole piece. It didn't take me long to justify small cuts of the velveteen, and now that I've seen how well it sews up, I am thinking about bigger projects. 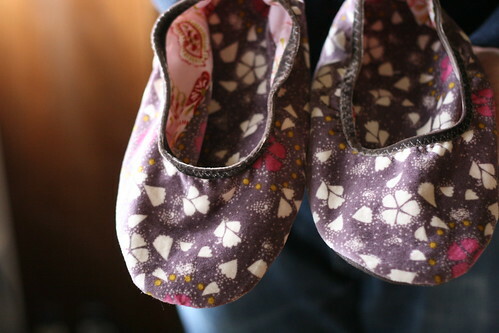 I am particularly fond of the slippers from Zakka Sewing by Therse Laskey and Chika Mori. In fact, I am fond of many of their patterns and hope to complete one or two for the holidays. Anna Maria has a slip on slipper pattern Handmade Beginnings that uses upholstery foam for the souls-- they look super comfy. If you're going to gift these and are feeling a little ambitious, you won't want to forget the monogrammed drawstring bag!